Hummingbird Cake, with its moist texture and flavoring from pecans, pineapple, and banana, is one of my favorite southern cakes. Usually I make a traditional-style Hummingbird Layer Cake with Cream Cheese Icing, but I was in the mood to make a poke cake, Hummingbird style. I had never eaten a Hummingbird Poke Cake before, but I thought it would be a fun and unique dessert. I added 1 cup of ripe mashed banana, an 8-ounce can of crushed pineapple, and 1 cup of chopped pecans to a box of yellow cake mix. I then added the water and oil that the cake mix called for but cut down on their amounts since I was adding liquid and moistness with the pineapple and banana. To bake the batter, I used a 9×13-inch pan and I let the cake cool slightly before I poked holes in it using the back of a wooden spoon. Next I mixed together vanilla pudding mix (you could use banana flavor if you want a stronger banana taste), milk, and sweetened condensed milk and slowly poured it over the cake so that it seeped down into the holes. After the cake had been in the refrigerator for about 6 hours, I made a delicious, creamy but light frosting using cream cheese, whipped topping, and powdered sugar. After spreading the frosting on the cake, I did a sprinkling of pecans and it was ready to be devoured. The texture was wonderfully moist and sweet, almost like a tres leches cake. 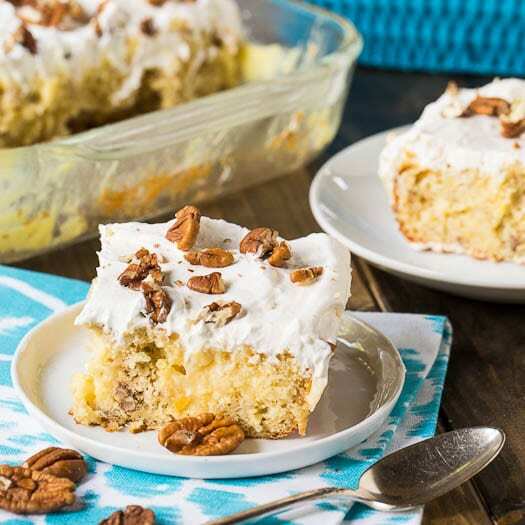 It’s an easy and fun make-ahead cake that will feed a crowd. An exceptionally moist and delicious Hummingbird Poke Cake flavored with banana, pineapple, and pecans. 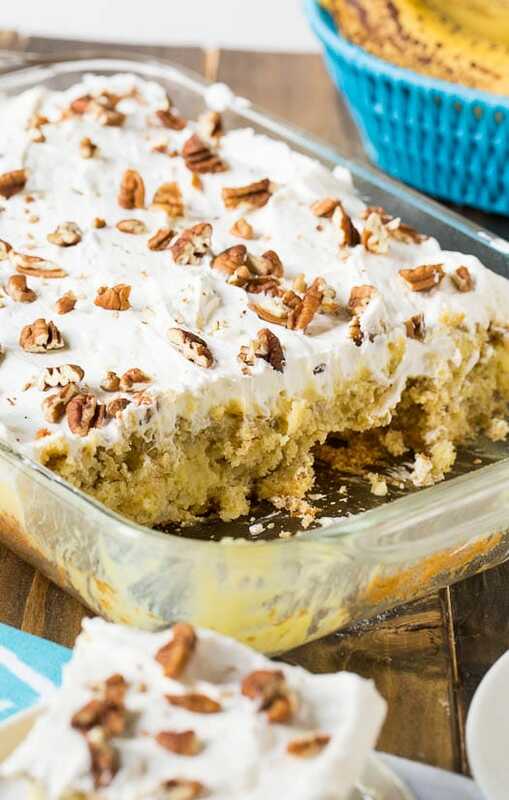 Topped with a creamy and sweet cream cheese frosting. To make frosting, use an electric mixer to beat cream cheese and 1/2 cup of whipped topping together. Add sugar and remaining topping and beat just until combined. This entry was posted in Cakes, Desserts and tagged banana, bananas, cake, hummingbird, pecans, pineapple. Bookmark the permalink. This cake has such awesome flavor! Love the creamy texture! I can’t find a single box cake mix that is 18.25 ounces. All of them are 15.25. This cake was amazing! Our whole family loved it! The cream cheese frosting is wonderful- not too sweet like so many recipes. What a treat! Thank you for this great recipe!!! For some CRAZY reason this has been blocked on Pinterest! ! Hopefully someone can get it back up! Made this cake and I loved it, call it anything you want to call it I’ll call it good and oh so easy. Okay, this doesn’t EXACTLY taste like a hummingbird cake, but it is a zillion times easier and VERY good. 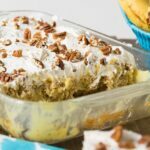 I came on your site to get The Original Hummingbird cake recipe but when I saw the Poke Cake, I knew this was the one I needed it to make! I’ve never really liked layering cakes so this is just right up my alley! 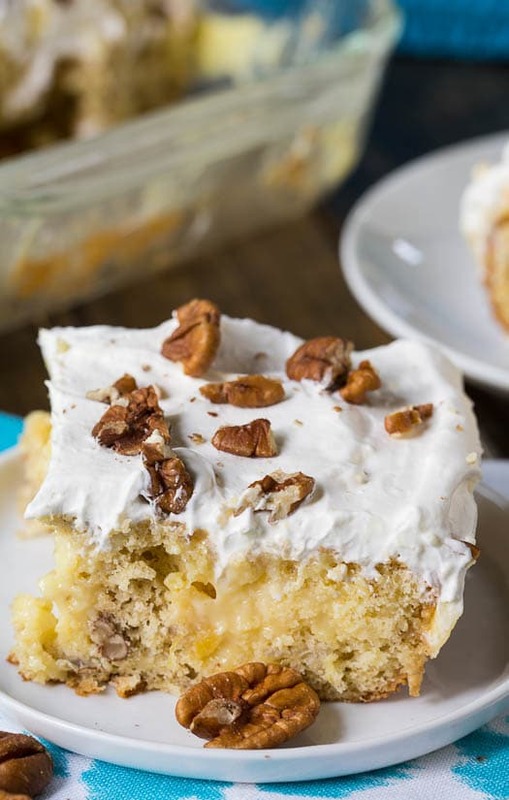 I have made one other poke cake (The PeanutButter Finger Cake) and everybody devours that one like crazy so I’m sure this one will go over just as well as the other….Cant’t wait to start making it! Made this cake yesterday for company, worse cake I ever made. Sounds so good, but really had very little taste. Threw most of it out to the birds. You can see from the gorgeous pics how soft and fluffy this cake looks! I just love hummingbird cake – this one looks like a winner! Anything with condensed milk and I’m there! I am so glad you reminded me of hummingbird cake! I had never had it here in California, but when visiting family in Kansas I had a slice at a dinner party. It is so good! Such great flavors. Your version looks delicious. Can’t wait to make it! I’ve actually never made a poke cake but this hummingbird cake looks like to perfect way to start! That looks so pretty and so good. I have been wanting to bake a hummingbird cake and seeing your post, I am going to do it asap. I had never heard of a hummingbird cake either until I tasted weddings cake options last year, and I was sold. So delicious! I’ve never had hummingbird cake before but it surely does look delicious. I’m thinking of making it for a party I’m having on Sunday. I’d never heard of hummingbird cake until another blogger featured a recipe. Now, I keep finding amazing looking recipes for it. I think it is a sign I need to make this ASAP. I looks delicious! This looks amazing!!! I have never made a poke cake… But ought to sometime! Especially by how this looks… yum…!! This looks awesome! I don’t think I’ve ever actually had a hummingbird cake (and I even lived in the South for a couple years!) but I always see them and they sound awesome. Yours looks especially amazing with the pudding seeping through!! yum!! This one is no different. Looks like a delish dessert! A co-worker once made me the most delightful hummingbird cake – so I can imagine how good yours is with that pudding mix, milk, and sweetened condensed milk poking through – wow! Holy moly that looks amazing girl. I bet this is so moist since it is a poke cake, not to mention delish! The cake looks incredible!! so moist and so delicious.. Bananas, pineapples, pecans and cream cheese 😀 all my favourite ingredients… Yumm!! I have never heart of poke cake before. I definitely need to try this hummingbird poke cake. i’ve surprisingly never had hummingbird cake before.. definitely something i need to try. thanks for sharing the recipe! At first I was worried there would be coconut in this! So glad there isn’t – this looks great. 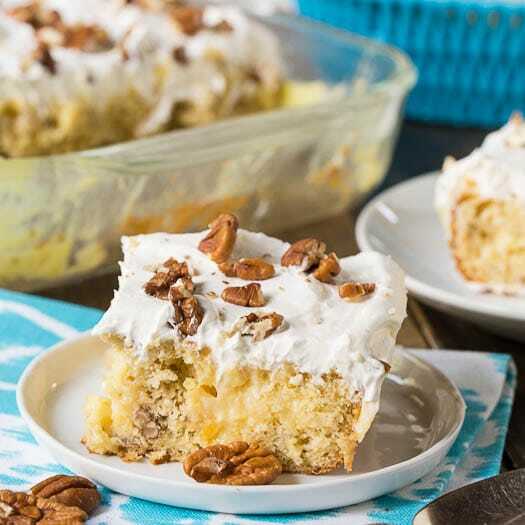 Can you believe I’ve never tried a poke cake before? I think I’ve pinned about a million recipes from pinterest, but never attempted one myself. This one looks amazing! I love the banana and pineapple combo, sounds perfect! Yum! I looks so moist and decadent! I love it!